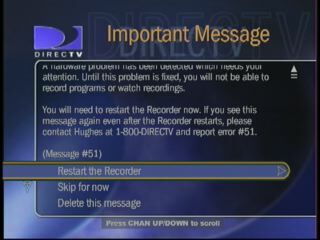 Many TiVo users who have moved around components or reformatted their hard drives have seen the Error #51 - also called a Hardware Error. This error simply means that the software on the hard drive has been serialized to a different motherboard, and needs to be reserialized to the current motherboard to work. 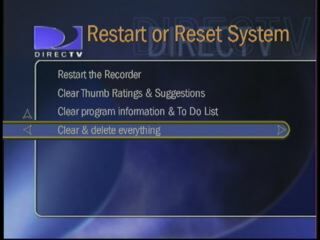 To reserialized the software on the drive to the current motherboard, the user needs to go into TiVo Central -> Messages and Setup -> Restart Recorder -> Clear and Delete Everything, and then follow the instructions from there. TiVo DVRs serialize to the current motherboard to protect the content on the drive. The drive, if moved to another unit, will not play back the content that has been recorded on the drive, and many other features will not work properly. In this way, content recorded on one machine cannot be played back on another by moving the hard drive. Many TiVo owners encounter this message when moving image files around from unit to unit, or downloading an image file from the internet. The image file was taken from a serialized unit, and when imaged back onto a drive, it still expects to find that original motherboard. As with most security measures, hackers have figured out ways around this one. For hacked TiVos, a script called 51killer can prevent future recordings from having this encryption. There is no known way to disable the encryption on already-recorded files. 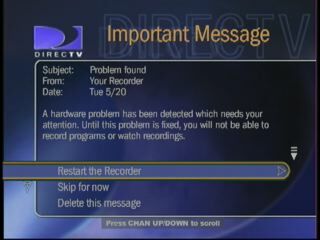 On the DirecTV TiVo THR22, this error is called a V51 error.